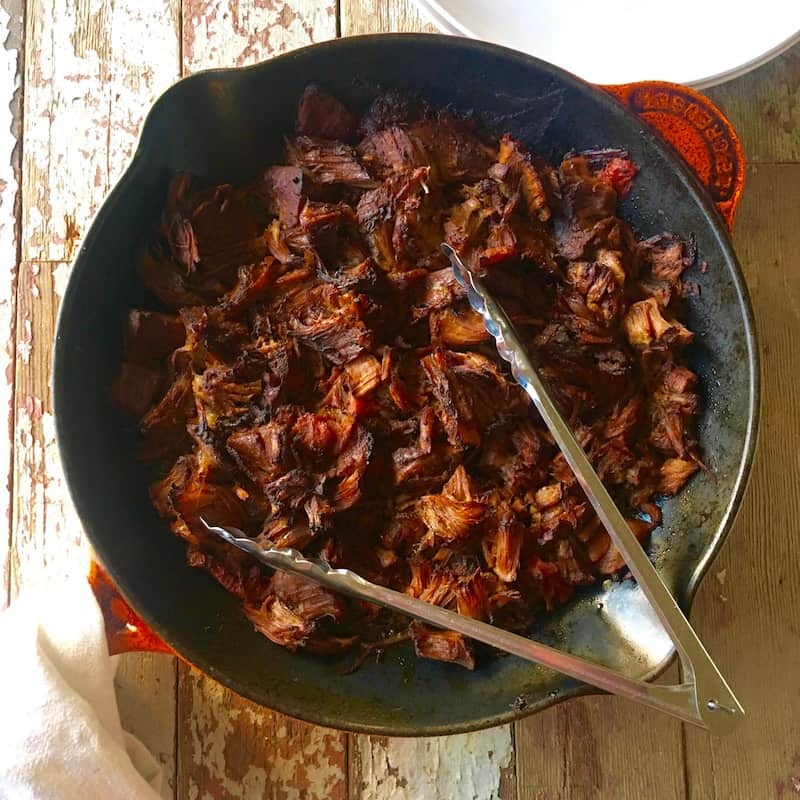 This recipe for Beef Carnitas is so handy to make on busy weeknights. No fuss no muss drop it in, walk away and let it cook all day long. You do put in a small amount of work to crisp them up but other than that you ignore it all day. I love to make these for Taco Night when we also have scouts, and everyone needs out the door extra early, but they still need to be well fed. Change up your Taco Tuesday game with these easy beef carnitas and everyone will be thrilled. I have had a revelation! I love throwing things in the crockpot and walking away until dinner is ready hours later, what I don’t like it shredded meat. I would make it because everyone loved it and it was easy, but I had a hard time eating meat cooked that was dry and shredded. Then the revelation happened–I could cook it and then crisp it under the broiler. It was the dawning of a whole new era in TACO TUESDAYS. And let me say that having at least one meal set in stone every week, even IF the actual meal changes but still says relatively the same, is a lifesaver. I mean it can be chicken tacos or vegetarian tacos but as long as it’s tacos life is good and everyone is happy. Back to the dawning of a new era in Taco Tuesdays. I may fall in a rut with these Crock Pot Beef Carnitas. Soft and tender and crisped up just right. YES, YOU CAN! Try my Low Carb Tortillas, a soft shell perfect for wrapping around these carnitas and getting down one Taco Tuesday. Yes they take a bit of work but they’re so worth it. But if you’re not up for a lot of work toss beef carnitas over salad and call it low carb. Not low carb? Then party on as usual just eating delish carnitas for a change. 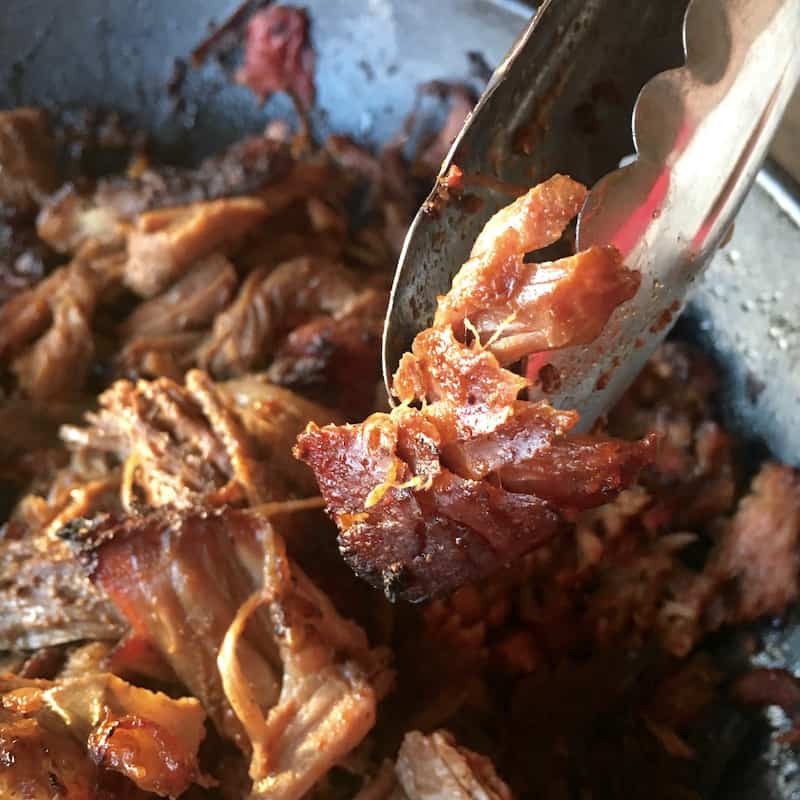 This recipe for Beef Carnitas is so handy to make on busy weeknights. Drop it in, walk away, come back and crisp it up under the broiler. So easy! So tasty! serve the beef with tortillas or use on nachos or make enchiladas too-so many ways to enjoy!